Mementos Mori by Manual Cinema. Photo by Richard Termine. BOTTOM LINE: Manual Cinema's awe-inspiring puppetry techniques make this a captivating story, even if it seems like one we've heard before. The story of Mementos Mori might not be a terribly original one—Death Takes a Holiday and its reincarnation Meet Joe Black both have similar plot lines, where death attempts to be human. But it is the means through which the story is told, not the story itself, that makes Manual Cinema's show so riveting. Overhead projectors shine onto screens on which shadow puppets dance. 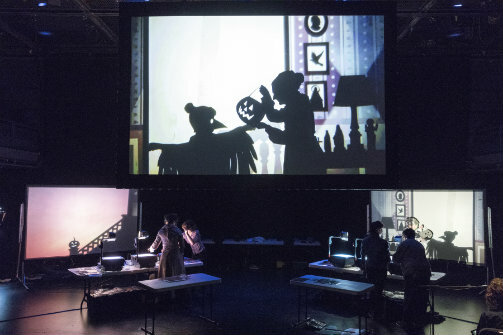 Live actors (wearing masks that augment their features to create more distinct silhouettes) stand in front of smaller screens, with a larger screen combining the actors and puppets into one cohesive scene. Watching the live actors makes the show more enjoyable, more alive and human; each actor impressively leaps from one screen to the next, never missing a beat. Musicians off to the side add to the enchanting feel. In Mementos Mori, Death modernizes his duties by using an app to track and kill off those whose day has come up. Early on, Death kills off the young, plucky Marie (Sharaina Latrice Turnage), who works as a bike messenger in Los Angeles. Death morphs into a biker and chases Marie through Los Angeles traffic, weaving through cars and stoplights. After being killed, Marie wakes up in ghost form in the morgue. Finding her cell phone, Marie watches the details of her death and funeral unfold via social media. Seeing a reminder for a Halloween party, she attends, hoping to pick up her life where she left it, only to find out that she is invisible to her friends. Marie instead spends the night as a ghost, dancing next to humans costumed as ghosts, and even with Death himself. She is then doomed to spend the rest of her existence watching those around her carry out their lives via social media feeds. Death then comes for a cinema-loving movie theater projectionist (Linsey Falls) who lives in a dream world consisting of cinematic nostalgia. Here the puppetry morphs into visually stunning dance scenes, straight from the golden age of cinema. These dazzling images fill up the projectionist’s otherwise lonesome existence. In order to pull him in, Death decides to take on the form of Audrey Hepburn in Breakfast at Tiffany’s. But while posing as a human woman, Death begins to develop human feelings. Soon, Death's heart is set atwitter, so that Death no longer has any desire to kill the projectionist. And after witnessing the lonely ghost girl watch her own funeral in despair, Death decides to stop taking lives, at least temporarily. Overall, Mementos Mori is a dazzling piece with one-of-a-kind puppetry and animation, unlike anything I’ve seen before. The live music and vocals give it an infectiously whimsical feeling that pulls the audience into its dream world. While the story isn't new, Manual Cinema shows, once again, that they are capable of creating mesmerizingly magical worlds. Whatever they cook up next will certainly be worth viewing. And while Manual Cinema may have already left town, there is still plenty of time to take in the rest of BAM's always unusual Next Wave Festival, which runs through December 16. Mementos Mori is by Manual Cinema, Directed by Julia Miller. Choreography is by Sarah Fornace. Puppet Design is by Drew Dir. Associate Puppet Designer is Lizi Breit. Music and Sound Design is by Kyle Vegter. Costume Design by Mieka van der Ploeg. Mask Design by Julia Miller. Stage Manager and Live Video Editor is Mariana Green. Puppeteers are Lizi Breit, Linsey Falls, Diane Maire, Sara Sawicki, and Sharaina Latrice Turnage. Musicians are Deidre Huckabay, Michael Hilger, Alex Ellsworth, and Maren Celest.